Since last year I have been working on a secret project in my short “free time” . I decided to keep it under the radar because I didn’t want to generate high expectations about it, until now that I feel ready to share it. I was really busy last year but I felt that I needed something else to channel my creativity and new ways to explore new techniques and there it was born “SweetPartyLab” my own Party Laboratory where I enjoy creating Digital Party items, Illustrations from my own sketches and more. I am so exited to have a new project in this new year, that I couldn’t wait more to start. I have been working on some old sketches and some new characters for my cliparts and new printable parties. More details about “SweetPartyLab” soon. 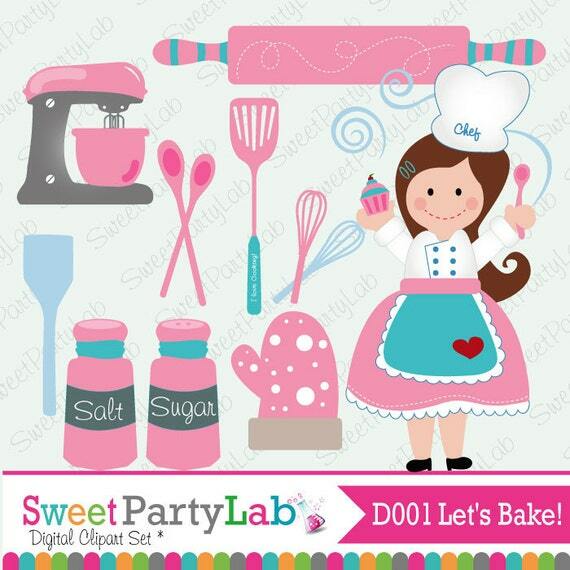 My first product is an adorable Clip-art set called ” Let’s bake, Sweet Baking Clipart Set , that includes many cute cooking tools and a very cute doll. This set is a wonderful stat for “SweetPartyLab” . All the files are for Instant Download.